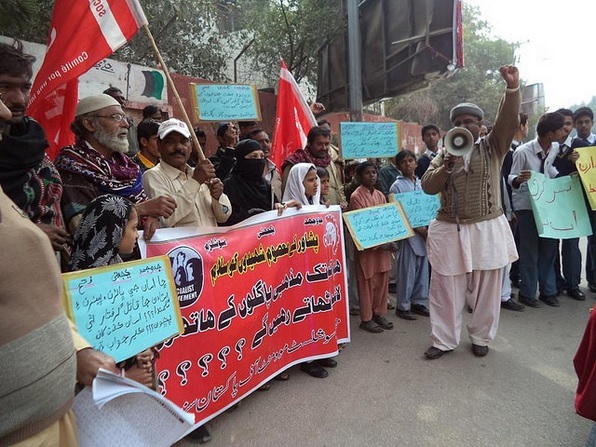 Below we publish a statement by Socialist Movement Pakistan (CWI) following the Peshawar massacre, along with photos and videos of a protest organised by SMP comrades in Sindh province, one of many organised around the country. This protest was covered by important media outlets. Stop the killings, no to the Taliban, no to religious extremism! United struggle of working class, peasants and poor needed to defeat the reactionary forces! Military action alone will not solve the problem! 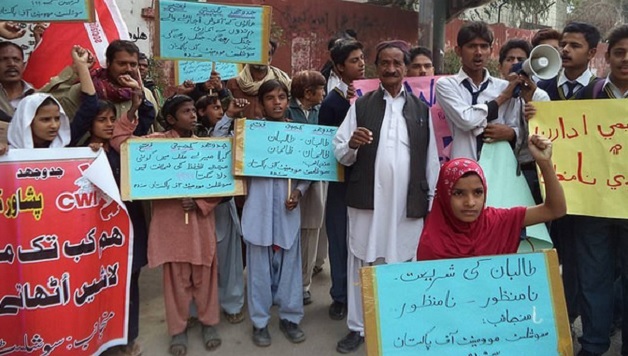 Socialist Movement Pakistan (CWI in Pakistan) strongly condemns the barbaric and brutal killings of innocent school students at the army public school in Peshawar, KPK province. We stand with the grieved families at this difficult moment. It is clearly a retaliatory and revenge attack aimed against the students belonging to military families. The message is loud and clear: ‘if you go after us, we will go after you and your families’. This cowardly attack has once again exposed the real nature of the Taliban movement and the other religious extremist forces who want to terrorize the whole society. The Taliban and other reactionary forces want to impose their reactionary ideology and agenda on society. They want to rule by fear and destruction. These forces are using religion to justify and legitimize their actions and medieval ideas. These forces want to take society back to the dark ages. So far, the Taliban and other reactionary religious forces have failed to tame and frighten the working masses. The working masses have so far refused to bow down to such forces and continue to defy them. The overwhelming majority of the working people do not support religious extremism and militancy. Support for the Taliban and other religious extremist forces is at the lowest level among the working masses. There is anger in society which has not been clearly demonstrated in recent years. It is time for the working masses to show and express their anger through demonstrations and protests throughout the country. It is time to send a clear message to the reactionary forces that such cowardly attacks will not be able to defeat our determination and resolve against such forces. A united struggle and movement of the working class, peasantry, rural and urban poor and sections of the middle classes is needed to defeat the Taliban. The trade union movement and workers’ organizations should end their silence and organize mass struggle against the reactionary forces. The working class has potentially colossal power and the ability to lead this struggle. The working class and poor masses showed this immense power, courage and sacrifice in the revolutionary movement of 1968-69. The Pakistani working class has a rich history and tradition of struggle. The working class has a long and rich history of struggle and sacrifices against the successive military dictatorships and for democratic, economic, political and social rights. It will rise and come to the forefront in this struggle. It is time for mass mobilizations of the working masses not only against reactionary forces but also against this rotten feudal-capitalist system. The struggle against religious extremism and Talibanization is a political and ideological one. The Pakistani ruling classes have so far proved that they are not capable and willing to carry out such a struggle. The Pakistani ruling classes and imperialist powers created these reactionary monstrous forces to accomplish their political, social and imperialist interests. Now they have lost control of them. This struggle cannot be won just through military means. Military action alone cannot wipe out religious extremism and militancy from society. The military operation might disperse Taliban and other extremists groups and weaken their command and control centers and physical infrastructure but it will not defeat their ideology. The ongoing military offensive in North Waziristan clearly demonstrates this. The army has so far killed more than 1,600 militants in the tribal areas since the launch of the military offensive and hundreds have been arrested. We have been told the command and control center has been dismantled and physical infrastructure been destroyed. The Taliban leadership has been dispersed and is on the run. But still, attacks on the security forces and civilian population are carried out by these groups. These groups are not confined to the tribal areas but exist throughout the country. They have supporters and sympathizers in the different areas of the country. Religious schools are their safe havens and hide outs and also their major recruiting grounds. 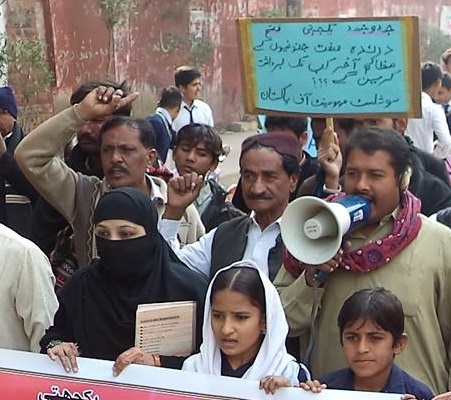 These religious schools are nurseries for the religious extremist groups and militant groups. But there is no plan and strategy in place to deal with this problem. It needs a political and ideological struggle and movement against these reactionary and monstrous forces to defeat them. This movement must be led by the working class. There is no doubt that capitalist and the feudal system has failed. But the real alternative and viable system is Socialism. Socialist ideas are the only way forward for society. Previous articleVictory Against Seattle Rent Hikes!